It can now be officially announced that the oldest military air squadron in the world, Number 1 (Fighter) Squadron, will be reformed with the Typhoon FGR4 fighter aircraft. The announcement was made by Air Vice-Marshal John Feesey AFC the Squadron Association President, with the authority of the Air Force Board Standing Committee. Air Vice-Marshal Feesey made the first official announcement of the allocation of the No 1 (Fighter) Squadron numberplate to the fourth front line Typhoon unit at a Squadron Association dinner held on 19th May 2012 in the Harrier Heritage Centre at RAF Wittering. The dinner celebrated the centenary of the formation of the Squadron on 13th May 1912, since when the unit has been equipped with numerous fighter aircraft including the famous Harrier "jump jet", which it operated for 42 years. The Squadron was sadly disbanded on 28th January 2011 when the Harrier was taken out of service as a result of the Strategic Defence and Security Review. The date of reforming will be 15th September 2012 at RAF Leuchars in Scotland to coincide with their Diamond Jubilee air show. The role of the Squadron will be air defence, including Quick Reaction Alert (QRA) providing a 24 hour, 365 day capability to intercept and identify intruders into UK airspace. The aircraft will also have a secondary precision ground attack capability. The Squadron can date its ancestry back to 1878 and the formation of a Royal Engineers Balloon Equipment Store, later No 1 Company of the Air Battalion of the Royal Engineers, equipped with airships and balloons. The battle honours it has since won reflect a rich history including the Western front 1914-18, Iraq 1921-26, Battle of France 1939-40, Battle of Britain 1940, Fortress Europe 1941-44, France and Germany 1944-45, the Falkland Islands 1982, Kosovo 1999 and Afghanistan 2009. 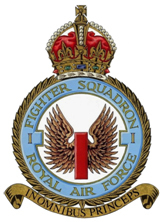 Over the years the Squadron fought dog fights with the Red Baron and in the Battle of Britain, participated in the “D” day landings and in Operation Market Garden (“a bridge too far”), shot down doodlebugs, helped pioneer the jet age and played a vital role in the Falklands, Kosovo, Iraq and Afghanistan conflicts. Among its ranks have been some of the most famous, colourful and decorated pilots and ground crew in the annals of air warfare.